Structural integrity is the ability of a structure to function as specified under service loading while keeping its strength (i.e. no structural failure) and shape (i.e. no excessive deformation). Hence the structural integrity is a measure for the quality of the structure. The structural integrity assessment of a component or structure integrates aspects of stress analysis, material behaviour and the mechanics of failure into the engineering design process. Stress analysis involves the study of how applied loads lead to internal stresses in a structure. The mechanics of failure involves the study of failure modes as a function of those internal stresses, material behaviour and properties and environment. The art of good structural engineering is keeping the structural integrity capabilities on an acceptable level during the specified life of a structure. In a well-designed system, a localized failure (defect, flaw, etc.) should not lead to failure of the entire structure. During the life of a structure there will be some loss of the initial structural integrity. There are different degradation types causing this loss: gradual degradation, time delayed degradation and sudden degradation. 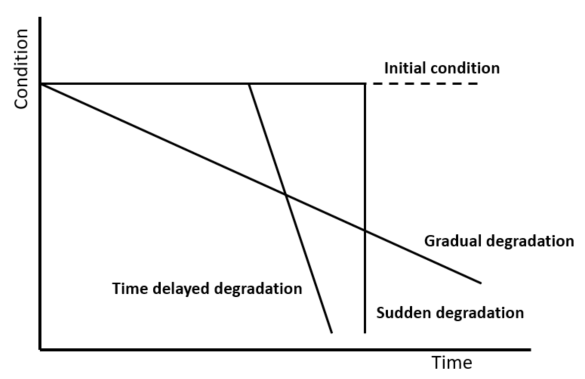 Typical gradual degradation forms are wear, creep and material degradation (e.g. metal corrosion, UV degradation in composites, rot in timber, etc.). Fatigue and stress corrosion are to be considered as time delayed degradation. In fact, also for these failure modes degradation starts at t=0, but initially the reduction in condition (i.e. increase in crack length) is so small that it is not noticeable. So the apparent degradation is time delayed. The third degradation type is sudden degradation. This could be impact damage or overload (i.e. large load that is not anticipated as service load). At some point in time the structural integrity capability of a structure reduces to an unacceptable low condition. This might be the level that the structure does not function anymore as required (e.g. too much deformation, partial failure, etc.) or the level that such condition is about to occur. Further reduction will lead to a full system breakdown, i.e. the full structure will fail. Operation: Indirect operational loss and direct cost of repair and/or replacement. Maintenance is the process of ensuring that a system safely performs its intended function with sufficient reliability. So the maintenance process focusses on performing operations at minimum cost and avoiding safety issues due to failure. Maintenance can be performed either scheduled or unscheduled. 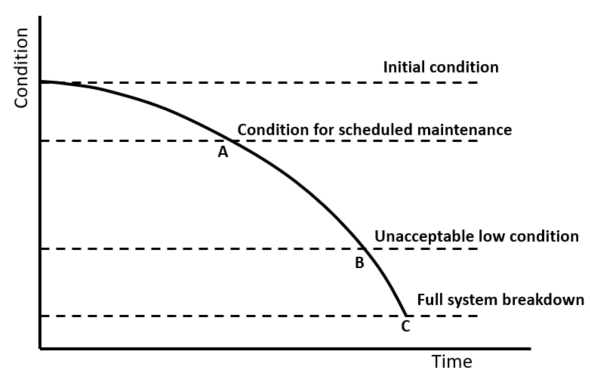 Scheduled maintenance is useful for gradual degradation and time delayed degradation. Such maintenance may include periodic inspection of the structure, i.e. checking the condition level. If the condition is below a certain level, the structure will be repaired or replaced. The inspection interval is often based on the degradation rate between points A and B in the above figure. 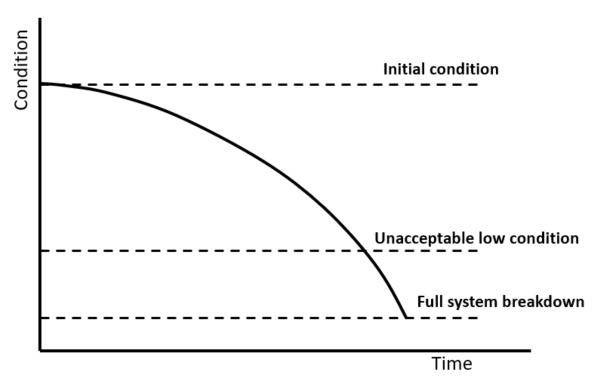 Especially for time delayed degradation, the time until first inspection (inspection threshold) can be much longer than the inspection interval. Another option for scheduled maintenance is predefined replacement. This implies that there is no inspection on the condition, but replacement of the component irrespective of the condition. The length of the inspection threshold and inspection intervals depend very much on the degradation rates. Establishing these rates is part of the design process. Note that different degradation causes may interact with each other, e.g. corrosion fatigue, and may increase the degradation rate. Scheduled maintenance for sudden degradation makes no sense. The time interval between A and B is zero and the location of A on the time scale is often just random. So for sudden degradation, unscheduled maintenance will be done. Design should then be such that after impact, overload etc, the probability that the structure has completely failed is sufficiently (i.e. depending on the consequences) low. Fatigue can be considered as time delayed degradation. For a very large part the fatigue life consists of initiation. During this initiation phase the crack is very short (no visible degradation) and does not have an effect on the condition of the structure. It has been mentioned before that stress analysis is an important part of structural integrity assessment of a structure. For fatigue this is even more so. Final failure often occurs at one of the more severe service loads, so that load will be important in the analysis. Degradation due to fatigue is a process caused by cyclic stresses, that means that not only the load causing final failure must be taken into account, but all load prior to that. Both number of occurences and severity (stress amplitude) of those loads must be known. With respect to fatigue, three different design concepts can be distinguished: 1. safe life (safety-by-retirement), 2. fail safe (safety-by-design), 3. damage tolerance (safety-by-inspection). Safe Life implies that by testing or analysis a design life is determined. Before that life has been reached the component will be replaced. So safe life is associated with scheduled maintenance, but without inspection to determine the actual condition of the component. The scheduled maintenance only involves replacement of the component (periodic preventive maintenance). Fail Safe design implies that a structure is designed such that failure of one element or component will not lead to failure directly of the complete structure. However, the failure of the element or component must be obvious, i.e. noticeable without dedicated inspection. So fail safe is associated with unscheduled maintenance (at point B). Both safe life and fail safe require S-N curves during analysis. Damage Tolerance assumes already some flaw, defect, crack etc. present in a component. Such a flaw will or will not be found at regular inspection (point A). If a flw is found, the component will be repaired or replaced. If not, the component will go back into service until the next inspection. The scheduled maintenance mainly involves condition monitoring. The inspection intervals (A to B or C) are determined based on degradation (crack propagation) rates and require fracture mechanics tools. The first inspection can be determined the same way as the intervals (common in aerospace), but can be often determined with S-N curves as well. Get the newsletter with our fatigue blog and information about our services and courses in your mail box.